Amazing Gracie is Almost Ready! My novella is back from my fabulous editor. I’m so excited! My ornery seniors will finally be live on the page. Amazing Gracie will be available on Kindle mid-January if all goes well. The holidays created a few delays but we’re rolling now. I never realized how it takes a village to birth a story. My critique partners got me to the point where I could send it to an editor without blushing. Kudos to the CritDivas! Let me tell you about my cover. The beautiful picture is by artist, Mick Williams, He lives close to Frederick MD. This is how I imagine the “big buildings” in downtown Skeeterville look. Some of his art hangs in the Boonsboro Inn. I never would have found him, but my husband took me to a gallery showing for one of his hockey playing friends. It was hard to choses one picture. My cover designer and web goddess is Becky DeLameter. I don’t know what I’d do without her. She also suffers through a lot of brainstorm sessions and my neurotic cover changes. My long-suffering family have tolerated many hours of Skeeterville history and activities. Amazing Gracie is a novella, i.e. a short novel. John Flynn directs traffic at the four way stop when he’s drunk, Gracie Moore, retired school teacher who would love to stop John. Irene Weatherspoon is head of the resident board at The Friendly Arms Apartments, and Wally is her long-time boyfriend. Irene helps Gracie with John, especially after he sees a dead body go by. The seniors ban together to solve the mystery. PLEASE WATCH THIS SPACE! The web site will have a new look soon. Thanks! 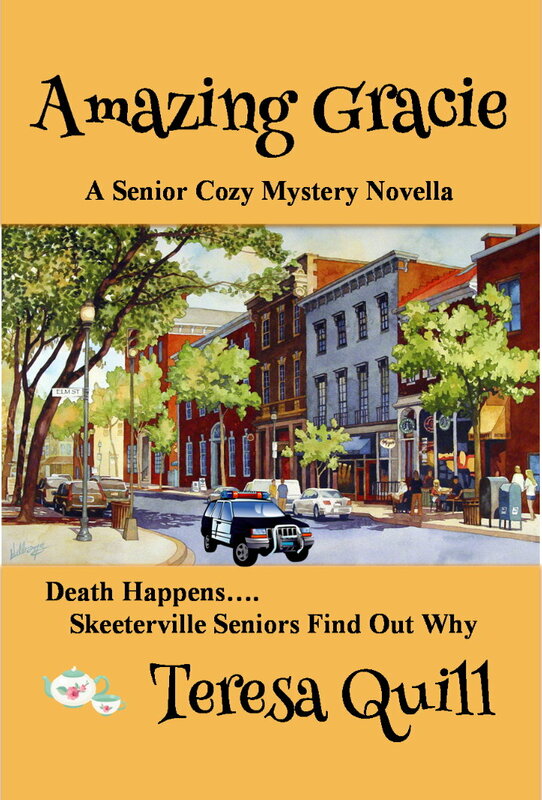 Posted by TeresaQuill on January 3, 2015 in Senior stories, Uncategorized and tagged Amazing Gracie, cozy, Mick Williams, mystery, seniors, Skeeterville, Teresa Quill.